Sad to report, Dear Readers, that the drab but very useful website, Bigenet, is no more. Recall that this was a website with indexing to some seventy million parish and civil registrations done by enthusiastic volunteers of nearly sixty genealogy groups across France. In November, its death throes amidst squabbles were reported by Guillaume de Morant in a way that annoyed the president of the Fédération Française de Généalogie, who denied any squabble, implying that their meetings over what to do to save Bigenet were civil discussions. In short, the site made no money and the FFG decided not to put money into it, and that is that. 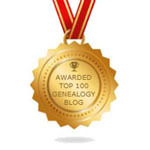 The economic struggles of genealogy associations in the face of the rapid expansion of the commercial genealogy companies, such as Filae and Geneanet were described here a couple of years ago. It is one of the many ways that the Internet is changing the economy, it seems. One can only hope that the various genealogy associations that were selling access to their work can do a good deal with Filae or Geneanet, or even Ancestry, so that they will receive enough money for their associations to survive. The real loss would be if they were to disappear.